Treasures of the University of Canterbury Library, edited by Chris Jones, Bronwyn Matthews and Dr Jennifer Clement (University of Canterbury, 2012), 256 pp., $30; Chur Chur: Stories from the Christchurch Earthquake, edited by Gina Moss (Project Freerange, 2011), 44 pp., $16.99; Shaken Down 6.3, by Jeffery Paparoa Holman (Canterbury University Press, 2012), 56 pp., $20. Treasures of the University of Canterbury Library, edited by History Lecturer Dr Chris Jones, Liason Librarian Bronwyn Matthews and English Lecturer Dr Jennifer Clement, is a wonderful-looking artefact, one of Canterbury University Press’s better art books, serving to reveal some extraordinary highlights of the over-two-million books in their holdings. It’s ironic, then, that the library has gone on a mad drive to convert to eBooks (not a fan, me — I like paper), and also put in a wine bar that I doubt most students could afford to patronise anyway. If similar biblioclastic tendencies had been enacted elsewhere and elsewhen, we might not have these lovely taonga lovingly catalogued in Treasures. Really I’m just grateful that it survived the earthquakes. Included among these ‘treasures’ (a threadbare word, almost as overused as the increasingly shabby term ‘iconic’ in these situations) is a splendid 1494 Lübeck Bible, an original 1611 King James Bible, and a five-metre medieval genealogical scroll unwinding from the Biblical Noah to King Edward IV. Of more recent vintage, and if less visually exciting just as significant, are documents from the 1946–48 Japanese War Crimes Trials, rescued by Erima Harvey Northcroft. Northcroft, who was a Judge of the High Court of New Zealand and a former Judge Advocate General of the New Zealand Army, sat as one of the judges on the Tokyo War Crimes Tribunal, and had the foresight and acumen to rescue these papers, making them the only surviving physical record. UNESCO has put them on its Memory of the World Asia Pacific register. Another jewel at first looks like a bland typescript, but on inspection turn out to be the lecture notes of the philosopher Karl Popper. Popper, born in Austria in 1902 and Jewish, one of the great minds of the twentieth century, taught at Canterbury University during the Second World War years, and in that time was able to write his celebrated and influential tome The Open Society and its Enemies, which defends liberal democracy against the totalitarian impulse, typified by the Nazis who sent him fleeing to the safety of New Zealand’s (relatively) ‘open society’. There’s also a lot of really important material in this University Library miscellany pertaining to the history of Christchurch and Canterbury, Maori whakapapa books, and other tasty titbits for you bibliophiles out there to drool over. The book, it must be said, is a beautiful-looking object, as befits a book containing many beautiful books (does that then make it a ‘metabook’? ); however, the soft cover format feels a bit flimsy held in the hands, and is not as robust nor as much of a showcase as a hardback would have been. Also, to return to something that worries me — though for some this may rank as only a minor quibble — as titles go, it’s a bit of a clichéd fizzer, a triumph of dullness, to borrow a line by Alexander Pope. Surely, all the variations on the promotional phrase ‘Treasures of’ have been flogged off to corporate sector group-think, or television infomercials. Christchurch is the common touchstone in my review of these three books. Thankfully the only tsunami the Canterbury earthquakes produced was a paper one in the form of a flood of books. It almost seems as if everyone in Christchurch wrote about being shaken up — me included (detailed at the end of this review). The voluminous output of earthquake volumes ranges from the short but sublime to the windy and borderline ridiculous — as if all that counts is having your say, no matter how unthought-out. 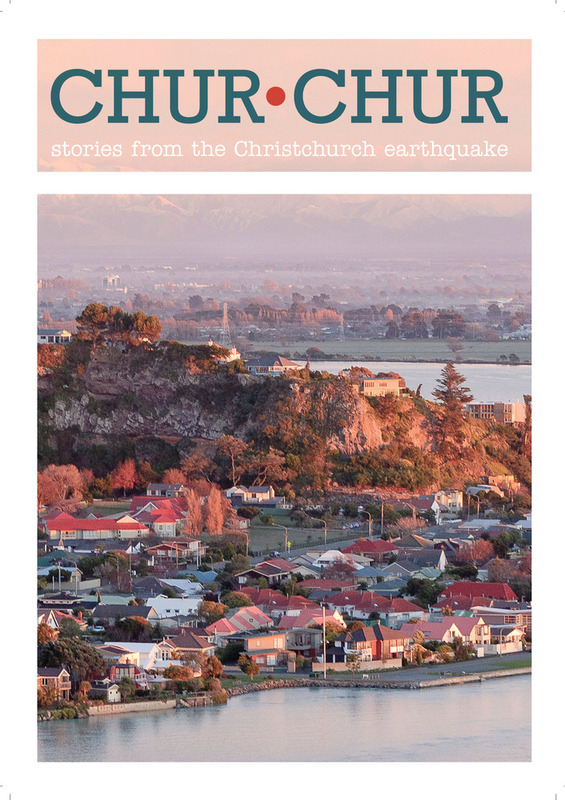 Amongst these latter is Chur Chur: Stories from the Christchurch Earthquake. I think you should buy it as a gesture, because the proceeds go to Architecture For Humanity, who are also helping rebuild in the Christchurch community, but not because it’s significantly good as literature. Sometimes that’s the way of it: a book is a recognised way of responding to an emotionally shattering event. Chur Chur is not much more than a thick pamphlet, and shows all the earmarks of having been put together from things lifted from the internet or elsewhere (and, naughty naughty, not always acknowledged). Madeleine Peacock’s ‘The Day that Life Changed’ is from the Fiordland Advocate; another piece is taken from photographer Tony Brunt’s blog; and there’s even a screensave of Rocky the boulder from the TradeMe site. There are two poems by Gary McCormick that originally appeared in the New Zealand Herald. Mr McCormick is a very witty and insightful commentator on the life and times of the middle aged, middle class Pakeha male, but as far as poetry goes in my view he lacks the ear for phrasal word-music possessed by his old cobber Sam Hunt. Hunt is a poet and McCormick is a poetaster. It’s a pity Chur Chur couldn’t be clear on what was original content rather than begged or borrowed; a bit shifty, that. Um. Well. So all in all, maybe worthy, but, like a dud root, a bit subpar between the covers. landing on lawns building up terror. In this reviewer’s opinion that’s fantastic use of metaphor — not too heavy handed nor so fruity as to seem anachronistic, and with just the right amount of lyrical drive to push the narrative along from line to line. Here, Holman proves he is one of the few contemporary New Zealand poets who can deftly spin the imagery like that, while also keeping the verbal music harmoniously playing along. Other poems, though, feel more like sketches, en masse, with many variations on the same themes. It could be that this is intentional — after all Christchurch itself is mostly a sketch now, stark in its repetitions — and we must remember, too, that this is public verse, a ceremonial verse, like that of the unfairly maligned eighteenth-century British laureate John Dryden, who was probably the last poet who could churn out occasional verse for civic occasions with consistent passion. Holman, ambitiously, is trying to render a voice that speaks of and to a civic occasion, a city’s state of mind. It’s not all about the Christchurch experience, however. Holman visited Japan in 2011 in the month following the Tohuku earthquake and tsunami that caused so much damage. The two catastrophes are successfully intertwined across the Pacific through Holman’s studied use of lnguage, imagery and tone. 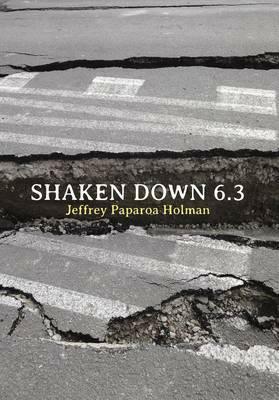 The poems collected in this slim volume are accompanied by photographs taken by Holman of places which have been changed by the quakes, and also included is an essay reflecting on whether art really can mitigate or alleviate in any way the human trauma of natural disasters. I myself think that that proposition, tentatively but carefully mused about by Holman, is a given — surely the arts are always being pushed to the margins of capitalist societies and rendered fragile as collective structures, so that in times of disaster they are hit hardest, while individual artists also know all the survival strategies and are often the first ones to bounce back and start the healing by telling the stories. Talking about disaster in poetry is a form of curing — or exorcising. The Christchurch poems are, I think, more resolved than the Japan poems. The latter suffer from occasional and forced-feeling orientalist drag. In ‘Kashii Beach tangi: for Ken’ there are simply too many Japanese words. Is it really necessary to say Manyoshu when ‘sixth century’ would have done, and sakura when ‘cherry blossom’ would have been fine. It gets in the way, plus I hate poems with footnotes. Similarly, calling terse tercets haiku doesn’t necessarily make it so — not that I’m a big fan of even technically correct English haikus, anyway. Regardless, this is a beautiful collection of poems about two significant events, rendered like an imprint off the real, and I for one consider it could become a future classic. ANDREW PAUL WOOD is a Christchurch-based writer, cultural critic and freelance curator. Recent work includes a translation into English of the New Zealand poems of German-Jewish poet Karl Wolfskehl, Under New Star: Poems from the New Zealand Exile (Holloway, 2012, edited by Friedrich Voit), and a psychogeography of the aftermath of the Christchurch earthquakes with photographer Doc Ross, Quietus: Observations of an Altered City (Analogue House, 2012). It is disappointing that the ‘imprint off the real’ isn’t a good quality print job. The choice of inkjet for Shaken Down means the text bleeds and there are striations through most of the otherwise interesting photographs. The use of soluble ink lacks classic resilience.